One such decision matrix to reduce hiring bias is the interview scorecard. By creating a matrix of candidate attributes or skills and the weight assigned to each, a quantitative assessment can be done by your hiring team. Because managers naturally hire those who most resemble themselves, the interview scorecard offers more than one hiring manager to offer their opinion based on the same variables. An interview team can objectively enter a score for each attribute and then get a better idea of the actual fit with the business. The types of interview questions will require specific answers related to the attributes and skills but can still be customized per applicant. A criminal background screening policy is helpful to determine which background checks are applicable per each job responsibility. Secondly, an EEOC Background Check Decision Matrix will offer clarity on criminal conviction disqualifications for each job position as well. 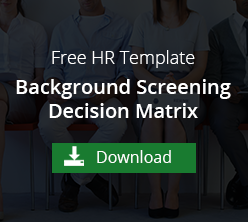 If there are a few candidates that qualify for the job, the decision may be easier by using a hiring decision matrix. Creating a matrix of candidates, skills, experience or education, interview scores and other attributes can offer a very clear picture of the best candidate for the position. Decision matrices can help reduce the risk of employer litigation, reduce hiring bias and potentially reduce the risk of high turnover for the organization. These objective tools help to level the playing field allowing hiring managers to make better and more objective hiring decisions.